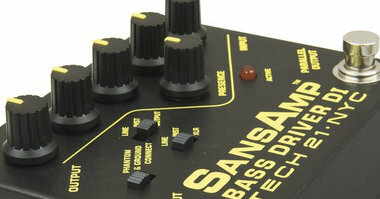 As mentioned in the original The B3K Bass Overdrive review, this particular pedal has managed to remain the overdrive flavor of the month for several years in many bass communities. However, Darkglass has an alternative, as the Vintage Microtubes overdrive shares some the same features and tonal territory. But that is only half the story as one little knob is able to take you through several decades in a single turn. The Vintage Microtubes pedals has 4 knobs. DRIVE and LEVEL are obligatory on drive pedals and they behave exactly as expected. DRIVE defines the amount of drive and since this affects the overall level, the LEVEL knob can be used to compensate – or if you actually want to also get a volume boost when adding drive, you can raise the overall level as you see fit. The BLEND knob is part of what makes the B3K so great, and in this case it does exactly the same – blends your clean tone in with the dirt signal. 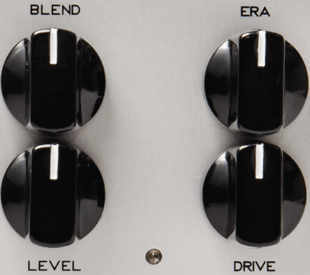 Now, the ERA knob is what makes the Vintage Microtubes pedal unique. 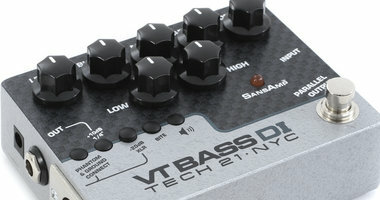 The goal is to be able to take you through different eras with regard to bass tone. Turned all the way down, you get a darker and more mid-focused tone that may remind you of the 70’s, and as you turn it up the tone becomes greadually more modern. When turned all the way up, you more or less get the signature sound of the B3K. The sound clips are structured around 5 rounds. The first 2 will focus on fixed settings of 3 of the knobs and then various settings of the ERA and DRIVE knobs respectively. The remaining 3 rounds simply present various settings on different playing styles. In one way, the Vintage Microtubes may appear less versatile than the B3K that offers two toggle-switches for further tonal sculpting. But having said that, the ERA knob brings in a different form of versatility. While I found most of the tones I could tweak out of this stomp box useful, most of the time I had the ERA knob above the 12 o’clock position. However, that surely depends on where your tonal reference comes from, and I guess for some situations that darker 70’s tone will do a great job. As is also the case with the B3K, the BLEND knob is a huge plus. Being able to blend in some of the dry sound is great for preserving a sense of the original tonal attack, and often there are similar, yet very unique, tones to find when dialing in just a little drive and little to no blend of the original tone versus more drive blended with 50-70% of the dry tone. I love the versatility in this scenario – almost as much as the core sound this pedal delivers. 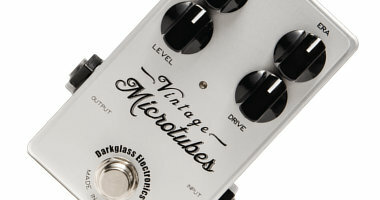 The Vintage Microtubes seems every bit as solid as the B3K – or any other Darkglass pedal for that matter. While the Darkglass pedals have seen a lot of use on my board recently, I cannot bring a I-have-used-this-pedal-for-decades-and-it-never-broke statement. Well, the company is not even that old. But my guess is that in a few decades from now, I will be able to do exactly that. As for the design, the only minor issue I have is the same as I mentioned in the B3K review. The power supply input is located rather closely to the jack connector on the input side, and when using angled jacks, the elements for a cable and connector conflict are present. That said, once the pedal is all ‘velcro’ed’ to the board and everything hooked up, it should no longer be an issue. Today (2015), you can buy a new Vintage Microtubes pedal for around $250, which puts it above the entry-level and mid-priced pedals on the market, but when listening to it, I think it is completely justified. It sounds that good. So yes, even considering the price point, I think it represents good value for money. Summing up, I love the sound of this pedal, the quality seems very solid and the price is relatively high, but also fair. So is this my favorite drive pedal so far? No, that would still be the B3K form the same maker, but that is simply a matter of personal preference. If you are looking for a great overdrive pedal for bass, I urge you to try both the B3K and the Vintage Microtubes. Chances are that one of them will make you a very happy bass camper.